Has anyone ever visited this monument in West Point? One pilgrim from the boisterous and rowdy town of Enid, MS could not locate the statue of the native artist. If you know the directions to marker, please let us know below. Thank you! 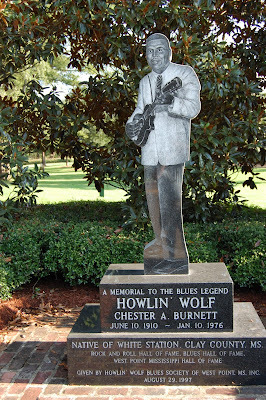 WEST POINT After a life of fame far away and obscurity in his native land, the late bluesman Howlin' Wolf was honored by his hometown Friday with a granite likeness. 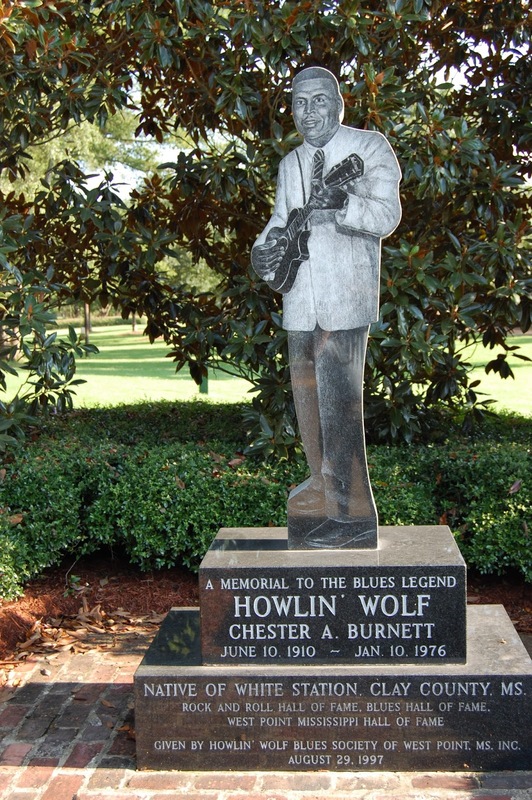 The life-size statue was unveiled by the widow of Howlin' Wolf, Lillian Burnett, in a ceremony prior to the city's second annual Howlin' Wolf Memorial Blues Festival. "This almost feels like the day we buried him," she said, "I'd like to thank everyone for honoring him. You didn't have to, but you did." 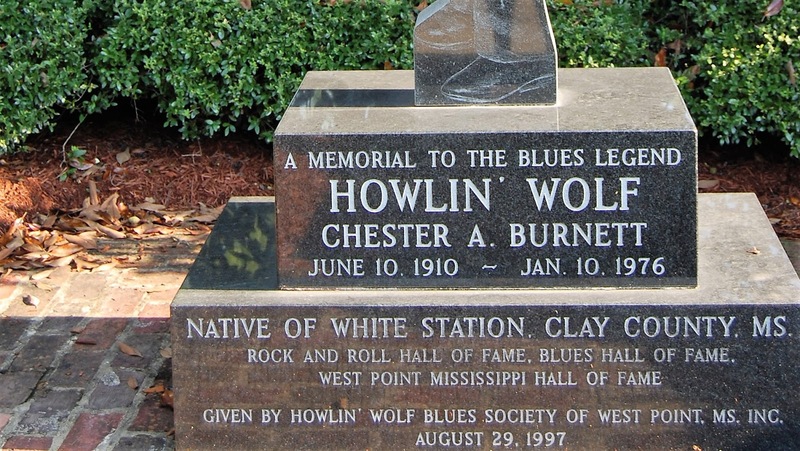 Known as the founder of the Chicago electric blues, an urban rendition of the Delta blues, Howlin' Wolf was born Chester Arthur Burnett in the White Station community of Clay County near the Monroe County line. 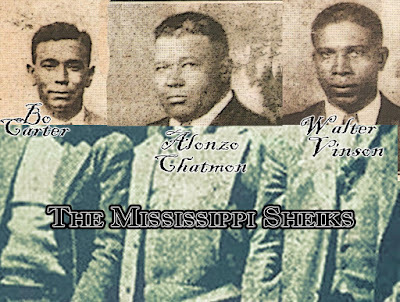 He lived there as a child until his family moved to the Mississippi Delta for work. Although relatively unknown for many years in the United States, Howlin' Wolf was hugely popular in England, where such greats as Eric Clapton, the Beatles, and the Rolling Stones were devoted fans. For many years, few people in Clay County knew that the Blues great was from the area. 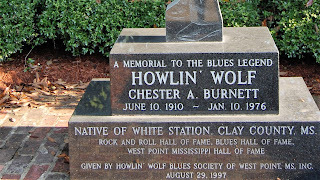 Howlin' Wolfs roots were called to the attention of West Point May-or Kenny Dill in the early 1990s when a California fan club called City Hall to see what West Point was doing to mark the anniversary of Howlin' Wolf's death. At the time, there were no plans. However, the call prompted the nomination of Howlin' Wolf to the West Point Hall of Fame, an honor that given to Howlin' Wolf in 1995. Barbara Marks, Howlin' Wolfs youngest daughter, was pleased that her father's legacy still lives on. "He was definitely not the average," said Marks. "You can tell that by the people who are here to celebrate him 20 years after his death." Candy Shines, the widow of Howlin' Wolf protege Johnny Shines, said the statue shows how alive the blues are in today's culture. "Blues was born in America," she said. We came here with no instru-ments, on a ship in chains. We had to learn to do with the slap-clap and the field holler that developed into the blues. 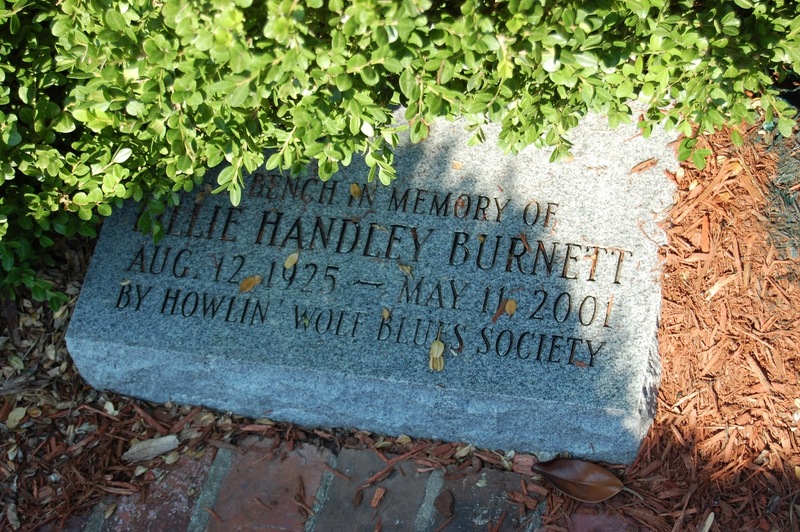 People like Howlin' Wolf and all the other blues greats made it possible for the rest of us."